We’re back for another round of the site-wide group read, One LibraryThing, One Book. 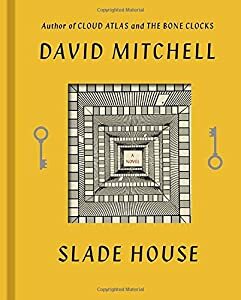 This month’s pick is the upcoming novel from Cloud Atlas and The Bone Clocks author, David Mitchell, entitled Slade House. Out October 27th, Slade House is a riff on the haunted house story, and explores five different characters’ encounters with the titular Slade House, spanning from 1979 to the present day. It’s a standalone novel, which also takes place in the same universe as last year’s The Bone Clocks. If you’re a fan of Mitchell’s work, or just like a good spooky tale (especially about creepy, old houses), I think you’ll enjoy this one! UPDATE: I recently had the opportunity to interview author David Mitchell! For more on Slade House and his work, check it out! Official discussion will begin on Monday, November 9th, at 12pm Eastern. Slade House is a very quick, shot read, so we will not be breaking this one up into chunks as we have with past OLOB picks. Until discussion kickoff, we ask that members not create any new Talk topics for Slade House. On the 9th, go right ahead! After Slade House, we’ll be taking a bit of a break until the new year, at which point we’ll be voting on our next OLOB pick. I would love to read with others Mitchell’s newest, Slade House, but really can’t at this time as I am in the midst of Proust, in a class once a week. I hope I can continue to receive your Library Thing blog, and I will look in on the Mitchell discussion once in a while to see how it goes. OK? I also would love to read Slase House. I joined recently so this would be my first go round with One Library Thing One Book group discussion.